Mr Butler reports, ‘As part of my Third Form Set 1’s study of ‘To Kill A Mockingbird’, we looked at Abel Meeropol’s poem ‘Strange Fruit’, made famous as a song by Billie Holiday. The poem looks at the contrast between the ‘Old South’s’ view of itself as ‘gallant’ and ‘pastoral’ and the horrific reality of lynching. Once we had analysed this incredibly powerful text, I asked the class to respond to it, giving them free rein to express how the poem made them feel. The responses were both varied and incredibly moving. 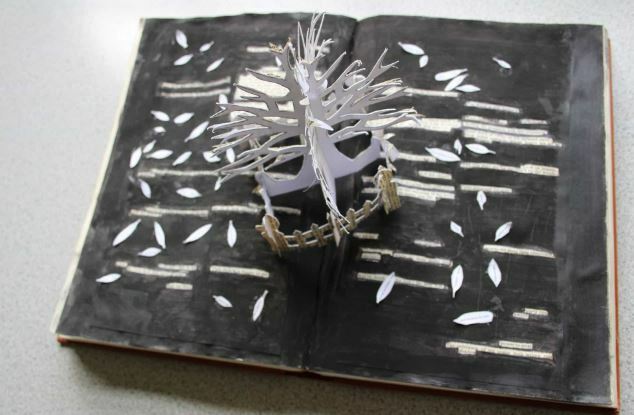 Kariella and Olivia made a tree from wire to show the ‘twisted nature’ of the scene described; Ariane, Millie and Emma produced a dark and threatening collage and painting, using the images of the poem’s first stanza. Girls produced a collage map of the US, made to look like a ‘pastoral scene’, but made up of pictures of a lynching, others produced a poem and a story in the voice of the tree.